Dr. Andrew Magiera and staff wish to welcome you to our new office, Greenville EyeCare! Dr. Magiera has been a staple in the Fox Valley for the past 12 years. 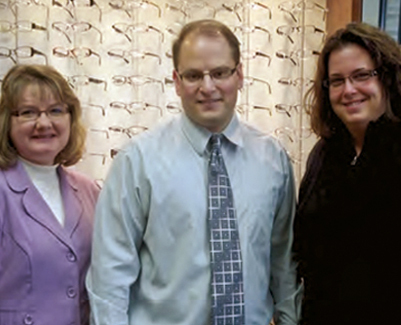 In 2011, he decided to fulfill a life long dream and open his own optometric office. This new state of the art office is located in beautiful Greenville, Wisconsin and serves the Fox Valley community. Dr. Magiera specializes in the treatment of eye diseases, including dry eyes, red eyes, glaucoma and foreign body removal. He performs comprehensive diabetic retinal evaluations. He also co-manages cataract and refractive eye surgeries. Dr. Magiera's dedicated and knowledgeable opticians have a combined 33 years optical experience to provide you with the best service. We provide the latest in optical fashion with many designer frame lines that are not available at any local vision center. Please click below to see our large variety of top eyeglass brands! Quickly and easily reorder your contacts through our office.